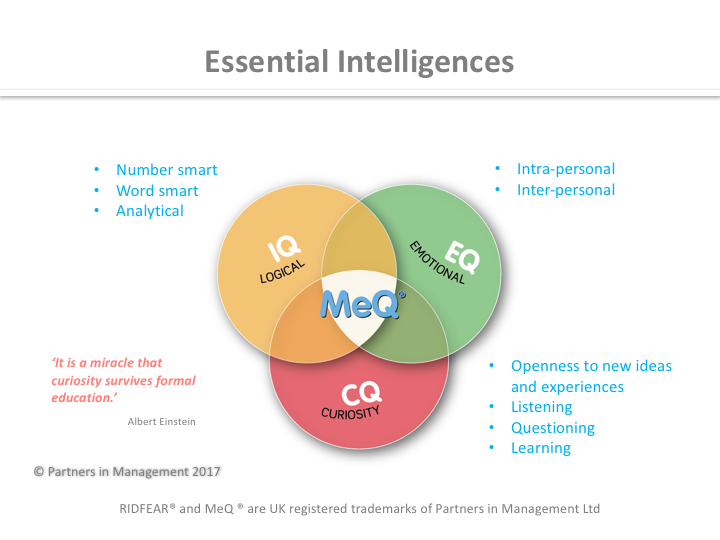 Now available separately, MeQ® is an integral part of the 21st Century Leaders course, and uses our RIDFEAR® self-coaching methodology to help participants appreciate, explore and develop their essential intelligences of Intelligence (IQ), Emotional (EQ) and Curiosity (CQ). We believe an Intrapreneur needs to demonstrate and develop these in order to manage, lead and create effectively. Through the course, participants can begin work out for themselves who and where they really are, what their strengths and skills are, what they want to achieve in both their personal life and work and then how they can develop and achieve that. Many organisations undergoing change, particularly those in the financial services and public sectors, have sponsored dedicated RIDFEAR® based self-coaching courses for their employees. Whether wanting to change and develop cultures, assist those experiencing redeployment or redundancy, help with issues of personal performance and attendance, or develop teams and personal commitment to objectives, then a MeQ® in a corporate setting or a pure RIDFEAR® course on a personal basis can help. This has been by helping employees reconcile issues and the changes taking place with their own aspirations and both personal and team situations, so enabling them to ‘move on’ and positively engage with complex situations and essential change. It is usually delivered through two day group workshops run by experienced facilitators using a combination of thought-provoking exercises and activities. These workshops can be customised and facilitated as required to suit the circumstances facing the organisation and employees, plus be delivered when and where required. Please call 01484 500404 for a discussion about how MeQ® and RIDFEAR® could help you and your organisation adapt successfully to change. RIDFEAR® courses for individuals are available and run through our associate partners.